The Fleet “pre-London” half marathon – how did it all start? In the midst of the 80’s running boom and a conversation in the pub, the idea of a Fleet Half Marathon was born. 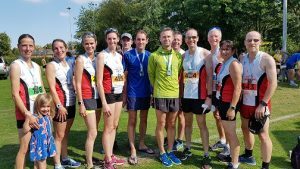 Following the first London Marathon in 1981, a group of local runners at Fleet & Crookham AC mulled over the idea – could it be done, would it be supported by the town, would the runners come? Under the direction of a small group on the organizing team and in particular the late Colin Gostelow, the race was born. After much planning and securing support for the Star Newspaper and other local businesses, the first Fleet Half was launched. Sunday 4th April 1982 – the first Fleet Half Marathon took place – a year after the first London Marathon. That year we had 1995 finishers – what an amazing number for a new event. It was won by D Stevens from Hastings AC in a time of 65:32 and the first lady home was local runner Paula Fudge in a time of 72.31 – she was 30th overall. In the early days the event was run out of Rushmoor Arena, the military arena in Aldershot. The Red Devils jumped in and the Band of the Gurkhas played. Going forward, the event was given permission by Chris Brasher, a friend of Colin’s to be known as “the pre-London” half marathon. The event grew and remained at its base on the edge of Aldershot until 1993 when it relocated to Calthorpe Park in Fleet. Starting and finishing now in the town, it truly was the Fleet Pre-London Half Marathon. The foundations had been laid for a very successful race to become a premier event in the town’s calendar and on the local running scene. Thousands of people have taken part in the years since. Competition has grown with many other “pre-London” half marathons having appeared and other local ones have grown into much bigger events and been taken over by event companies, but the original spirit of The Fleet Half being organised “by runners, for runners” continues today and Fleet & Crookham AC volunteers are proud and honoured to still organise it. The event has always been fortunate to attract partners which have helped with the enormous costs of putting on the event. 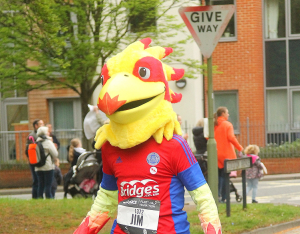 Every year the race has been supported by a major running brand and also by local businesses. Many of our runners are from the local area, but we also have runners coming from all over the country. 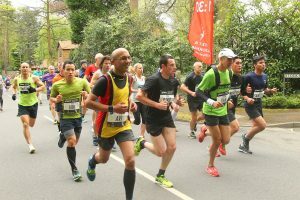 Long may the Fleet Half Marathon continue – the vision of a few has led to achievement and enjoyment for thousands. By the time the 2019 event has finished over 150,000 runners will have taken part.